BATON ROUGE — Community Press, LLC, today begins publication of the Capital City News, a community newspaper, on the 1st and 3rd Thursdays of each month. The Capital City News will publish news of parishwide interest with a particular emphasis on South Baton Rouge and the City of Central. Circulation will be 20,000 copies, distributed free at more than 200 stores in South Baton Rouge and Central, and by mail on a subscription basis. The office of Community Press, LLC, is located at 910 North Foster Drive, Baton Rouge, LA 70806. Phone 225-261-5055. For advertising information, call Shara Pollard at 933-2368 or Jolice Provost at 405-8894. Email news and photos to capitalcitynews@hotmail.com. 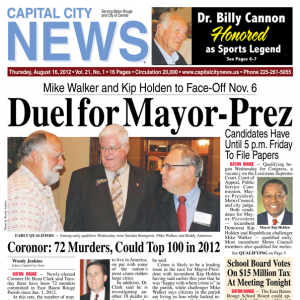 Community Press, LLC, also publishes the Central City News on the 2nd and 4th Thursdays of each month with distribution of 10,000 copies in the City of Central. For advertising information, call Shara Pollard at 933-2368 or Jolice Provost at 405-8894.